Do You Yearn For An Urn? The time had come to do something about our front yard. Years ago, Main Street in Terre Hill had been lined with huge oak trees. Their branches reached for each other across the street and met in the middle, creating a canopy that shaded sidewalks and cooled front porches. But when the electric and phone companies started trimming them, the trees began dying off. All that remained of the two that were in front of the inn was a tangle of roots and rotting stumps. Our ivy did a fair job of covering up the uneven ground. So we replaced the sidewalk and had the rest of the old stumps ground out. But it looked so empty. That’s when I remembered Hoover’s Farm Market. Located on Route 23 between Goodville and Churchtown (a mere five miles from the inn), they make concrete statues and urns. It's where I purchased my beloved three-foot bunny for the back gardens of The Artist's Inn. He has survived several years – in fact this winter’s snow covered almost all of him. even "outhouses" - so it’s worth a stop whether you need statuary or not. There is one drawback.....Hoover’s offers no delivery on urns. Getting the urns in the truck was easy - Hoover's had a contraption - sort of a cross between a backhoe and a forklift. 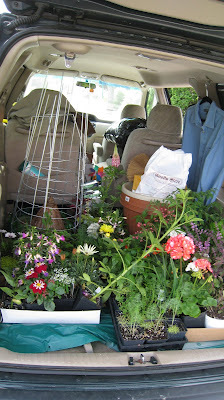 Now came the moment of truth - unloading the urns without breaking them - or any other body part. No job would be complete without a cheerleader, though I suspect that Taylor was more excited about the ice cream at dinner than the urns. Lynne stood by with refreshments for moral support. I was busy taking pictures. The flowers are planted and now we just wait for the ivy to fill in. So if this gets you yearning for an urn, you’ll know to head to Hoover’s. One of Lancaster County’s best secrets: great little shops that offer so much – they aren’t found on any tourist map and rarely do advertising. But the locals know about these jewels throughout Lancaster County. I’ll introduce you to some of my absolute favorites in this blog.....so stay tuned – after all, there’s always some shopping to do! Memorial Day is just around the corner...and so is Lancaster County! You don’t need to drive all the way to the beach this Memorial holiday. The water is too cold this time of year anyway. Besides, the shore traffic is a killer. Instead, head to the rolling hills of Lancaster County. 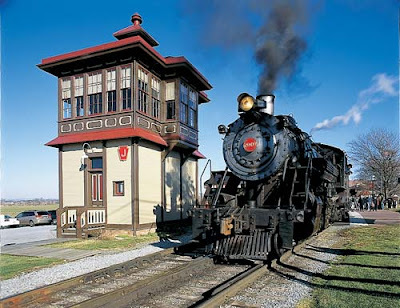 #10 – If you like history, we have lots of “old” things for you –plenty of century homes (they don’t make ‘em like this anymore), and living history museums like Landis Valley, the Cloister, and Strasburg Railroad. #9 – Are you the outdoorsy type? Hike some of the trails through Nolde Forest (15 minutes from the inn), Middlecreek Wildlife Preserve (about 20 minutes), hop in a canoe or kayak on the Susquehanna, or bring your bicycles and explore the backroads of Lancaster County. #8- Thinking of planting your gardens? Jan will share her favorite nurseries – most within a five-mile radius of The Artist’s Inn. Not only do we have great selections and knowledgeable owners, but the prices are terrific too. Many guests leave with their cars loaded. #7 – Do you like life in the fast lane? Maple Grove Raceway is only 12 minutes away – and because guests go the “back” way to our inn, you’ll avoid the traffic heading north. #6 – Eat, Drink and Be Merry – The Great Pennsylvania Flavorfest at the PA Rennasiance Faire is Memorial weekend – lots of great food, wine, beer and culinary information. #5 – Did someone say “shopping”? We have it all – outlets in both Reading and Lancaster, gallery row in downtown Lancaster, small shops specializing in crafts or quilts. #4 – Looking for treasures? 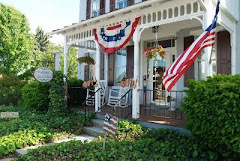 Adamstown (known as the Antiques Capital of the USA) is just ten minutes from the inn. We’ve found everything from an old buggy seat (we turned that into a coffee table) to the French antique furniture for the Kriss Kringle Room. #3 – Strawberries, lettuce, radishes and rhubarb – these are just some of the recent purchases fresh from the farms that surround the inn. Lancaster County strawberries are among the sweetest that you’ll find anywhere. You remember – the kind that are red throughout – not those tasteless white things that have spent too much time in a truck. #2 – The feeling you’ll get when you travel our backroads – rolling hills of green, Amish tending to their farms, and a connection with the land that you can feel. Drumroll please.....and the Number One reason to head to the Artist’s Inn this weekend? To slow down and reconnect with the one you love. Sit on the porch and listen to the birds chirp, hear the clip-clop of buggies, and let your cares melt away. Yes, we are just around the corner, but you’ll feel like you are a world away. The first bike ride of the year is usually challenging. It’s a process of waking up muscles that haven’t been used all winter and trying to adjust to sitting on skinny bike seats. This year was no exception. We couldn’t even remember how to get the bikes secured to the bike rack! Ah, but life in a small town pays off when our Mayor shows up to help out. Off to Valley Forge we drove. It was a beautiful day, despite the 25 mph wind and the (mostly) uphill trail that we took. We biked past the joggers, the walkers, past the kids flying kites in the field, people walking dogs, past children holding grandparents’ hands, and deer grazing in the open....back into history. Here is a park in the middle of suburbia but one would scarcely know it. There are vistas where you can see ridge after ridge of fields and trees – 3600 acres of them. Somehow it seemed appropriate that it was windy, and we could only imagine how cold it must have been in the winter of 1777. It was on one particularly steady climb that we came across a quote that seemed fitting: “It is beyond description to conceive what the men suffered”. Actually, we felt a little suffering ourselves...as we switched from gear to gear and finally walked the bikes up a hill. We came upon Washington’s Memorial Chapel – which seemed to beckon us inside to say a prayer of thanks. It’s a beautiful Gothic Revival building that also houses the Carillon and Justice Bell. This bell was used in the women’s suffrage movement. The clapper was chained to the side and not rung until women had the right to vote. So many sacrifices took place in Pennsylvania...all so that we would have the freedom to fly a kite, ride a bike, or worship at a church.